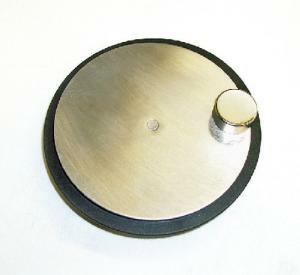 The included disk rotates freely on a shaft that fits into the plastic base. When the magnet is brought near the disk it stops instantly. The induced electric currents in the aluminum disk are called eddy currents, and their direction is given by Lenz law. The magnetic field caused by the eddy currents interacts with the magnetic field to produce an opposite force that slows down the rotating disc. Includes instructions.